Hope you all had a great Easter! I’m enjoying no work today; I could seriously get used to 4 day weekends haha! Slimming World wasn’t great last week, I put 1lb on but it’s no surprise when I think back over the week. It started with chocolate and crisps on Friday, a Mc Donald’s on Saturday, breakfast out and a crème egg on Sunday, a brownie on Monday, galaxy salted caramel on Tuesday (it was lush and worth the 1lb gain!) and sausages and oven chips on Wednesday. All in all not a great week. My evening meals were generally good though, it was the naughty treats every day that caught me out. It’s made me realise how easy it is to slip into bad habits – there is no need for a big treat every day. A little bit of chocolate is fine but when it’s something substantial the pounds can easily creep back on. This weekend hasn't been the best but I knew to expect that and I have made sure that when I'm at home and in control of the cooking it is all a lot healthier (apart from some pizza we bought for lunch on Friday). The worst we did at the weekend was the pizza, a meal out on Saturday night but I did make healthy choices and fish and chips by the sea on Sunday. Life is for living but not for over-indulging every day haha! 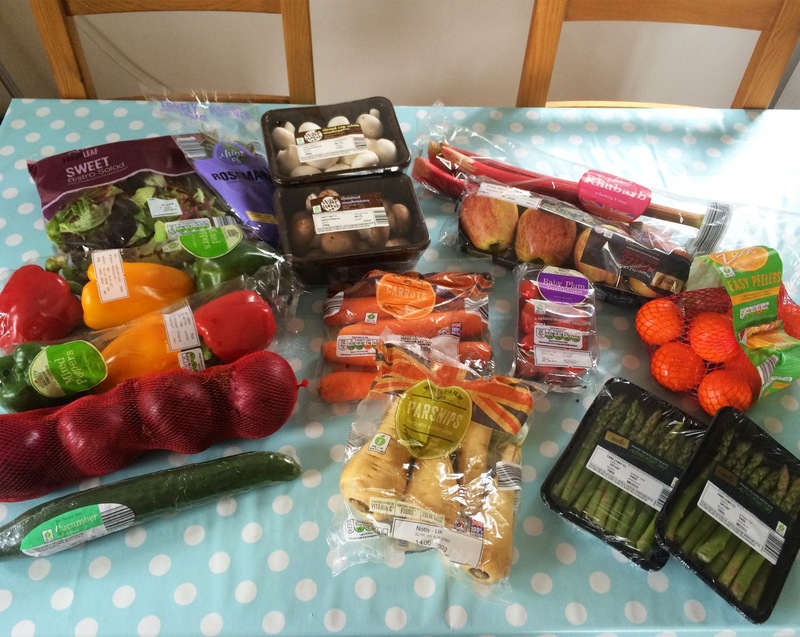 I’ve also decided this week to share my weekly shop with you along with the meal plan. The lovely Charlotte from Write Like No One’sWatching vlogs her weekly shop and it’s inspired me to do something similar. I’ll stick with photos though; I’m not brave enough to do a video just yet! 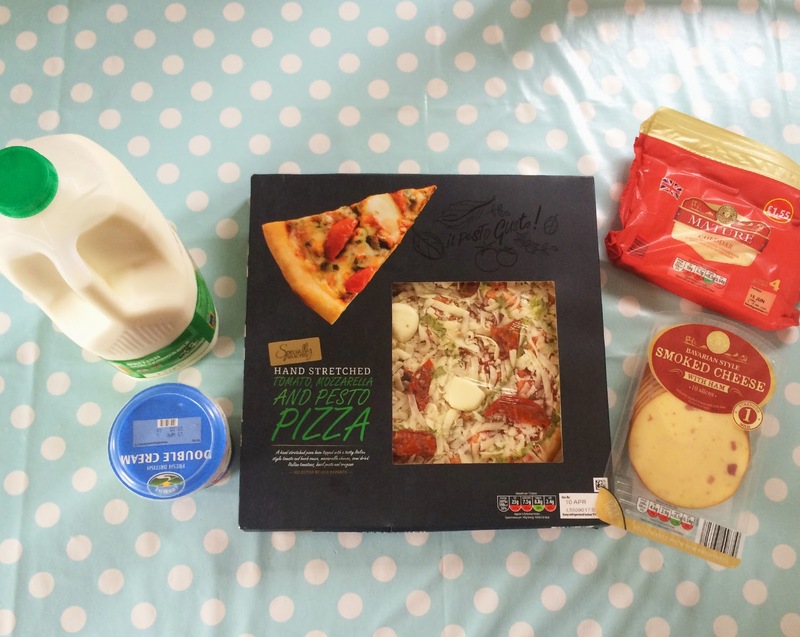 I did the shopping on Friday so these photos also cover what we ate over the weekend. As it's the start of the month some of this shopping includes store cupboard top ups and a few extra treats for Mr T as he's off this week on half term. Fruit and veg - we go through a crazy amount of peppers but I love them to bulk out a meal and get extra veg into us. The closed cup mushrooms are for general cooking (we also go through a lot of them and there is another punnet in the fridge) while the chestnut ones are for a carabonara I'm making later in the week. The asaparagus tips were a right bargain - 99p in Aldi! We also have spinach, peas and green beans in the freezer that work out much cheaper and more economical to buy frozen. We eat a lot of meat! I do want to cut back though... Since starting SW we have got into the habit of having steak as a treat on a weekend. It's only £3.79 a steak and works out a lot cheaper and healthier than a takeaway. Our plans changed for Saturday night and we didn't end up eating the steak but it's dated until the weekend so that will do us on Friday night instead. I love buying pork shoulder to make pulled pork. It's so cheap and I tend to be able to eek out quite a few meals from this (usually lunches with the leftovers so one or two less meals to worry about!). The bratwurst and smoked salmon are treats for Mr T; I don't like either so he can eat them next week for lunch while I'm at work. Streaky bacon is for the carabonara while the back bacon is for breakfast - yum! 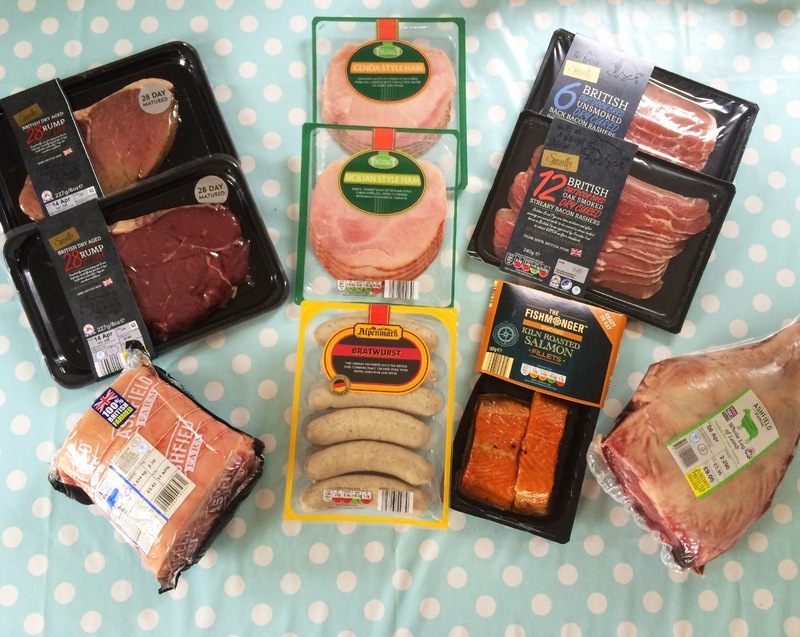 Drycure bacon is another Aldi bargain - only £1.59! I spotted the lamb all on it's lonesome by the gammon joints and when I saw the price (£9.05 for 2.3kg!) I knew I had to get it. I couldn't find any smaller joints but this will last us for quite a few meals. We will probably end up eating lamb all week haha! Cupboard stuff - Yorkshire Tea (why buy anything else? ), we go through this many eggs a week, it's crazy! Chocolate for emergency brownie making, olives for Mr T (ick!) tinned fish and veg, low syn snack bars for me and the best and cheapest sundried tomatoes - only £1 a jar! We go through these like they are going out of fashion; I tend to have one jar in the fridge and one in the cupboard at all times. So that's our food haul for the week plus a few household things that we needed. 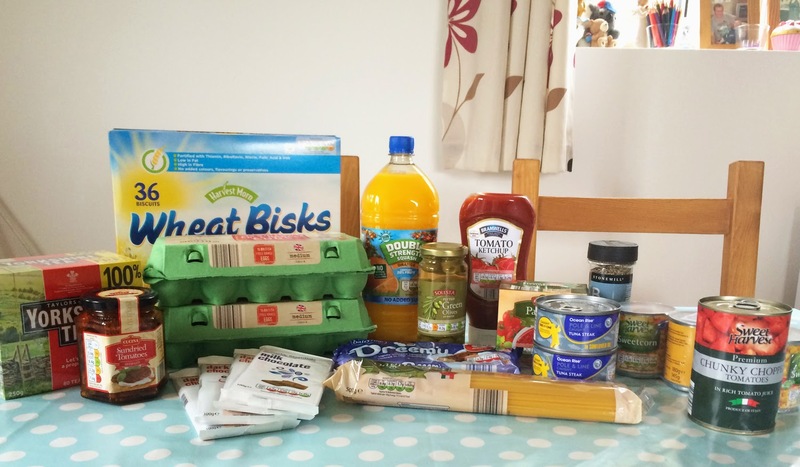 I love shopping at Aldi and this came to the grand total of £76.12! I think that's pretty good considering we got a massive joint of lamb, got nice steaks instead of blowing £20 on a takeaway and stocked up on some cupboard and household stuff. Looking over it again it turns out I bought enough to last us right through til next Sunday (I did the shop last Friday) so I'm even more pleased with the price now! 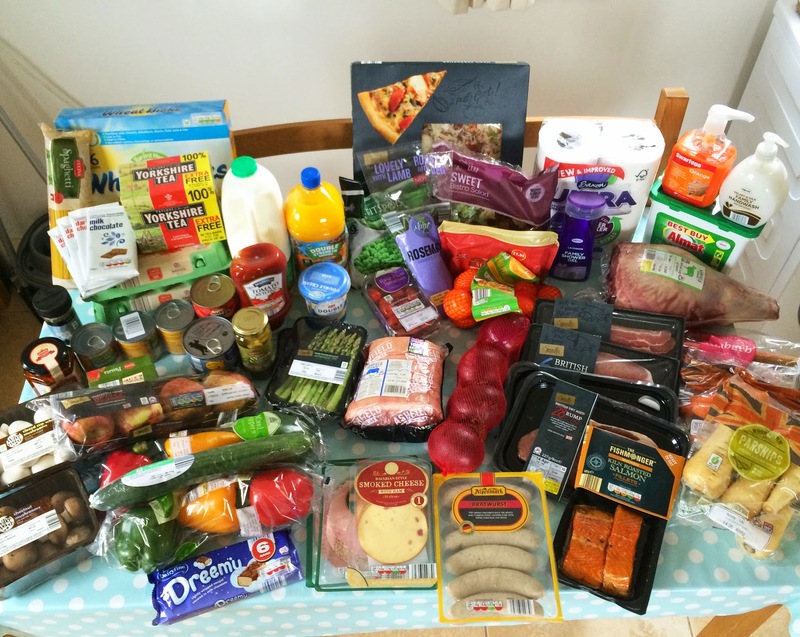 I find our weekly shop varies between £50 and £70+ a week depending on what we need. This was definitely an indulgent one but the lamb was worth it! Thursday – We are out for curry after weigh-in woop! Saturday – no idea; we are at a party in the evening and I'm not sure if food will be laid on. I think I'll deal with Saturday when it comes around. 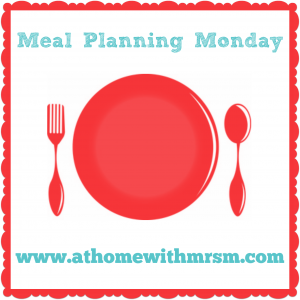 Sunday – Pulled pork - yum! 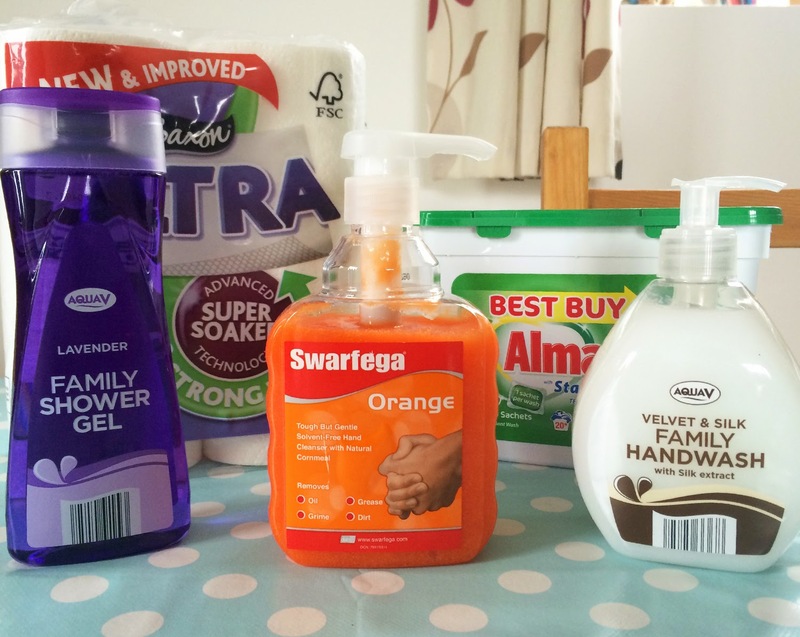 Thanks for bearing with me through a long old post but I'm downright nosey and love to have a peek at what other people buy so I thought I would share our weekly shop with you. 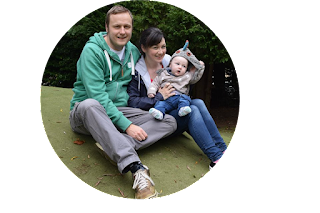 As always I'm linking up over at the lovely Mrs M's. I really need to shop at Aldi more....You did so well for your money! Honestly Kim you need to go, it's so good! The value and quality of the food is great.